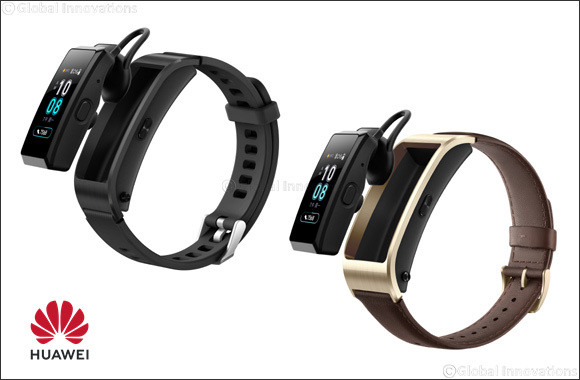 Dubai, United Arab Emirates – 19 August, 2018: Huawei Consumer Business Group (CBG) has today announced its latest wearable device, HUAWEI TalkBand B5, the fourth generation of Huawei’s TalkBand products and the successor to HUAWEI TalkBand B3 launched in 2016. Equipped with a 1.13-inch AMOLED touchscreen display with 2.5D curved glass and 160 × 300 pixels resolution, the HUAWEI TalkBand B5’s display is 2.4 times bigger than the previous one. Like its predecessors, HUAWEI TalkBand B5 is a 2-in-1 hybrid device, functioning as a smart Bluetooth headset and smarter health tracker. Thanks to the new device its users will be able to monitor their health day and night, and be certain not to have missed a call even when in meetings, exercising or catching a flight. The wearable comes with stylish and premium straps offered in sport and business editions. Powered by HUAWEI TruSeen™ heart rate technology, HUAWEI TalkBand B5 offers 24/7 continuous heart tracking and monitoring when running, treadmill running, walking and riding. HUAWEI Trusleep™ tracking technology, which was certified by the CDB center at Harvard Medical School*, can precisely monitor different stages of sleep including light and deep sleep, REM sleep stage, and wakefulness to provide users with an intimate sleep care. The HUAWEI TalkBand B5 is IP57 water and dust resistance so it works in rain and snow conditions, as well as being sweat resistant and functioning whilst washing hands. The HUAWEI TalkBand B5 will be available at the HUAWEI Experience Store located at The Dubai Mall and across select retailers in the UAE from 20th August 2018 at price of AED 699 for Sports Black Silicon Strap version and AED 799 AED for Business Mocha Brown Leather Strap version. 12-month manufacturer warranty across Huawei Service centers.